288 pages | 4 B/W Illus. The Exercising Female: Science and Its Application is the first book to provide students, researchers, and professionals with an evidence-based reference on the exceptional scientific issues associated with female participation in sport and exercise. 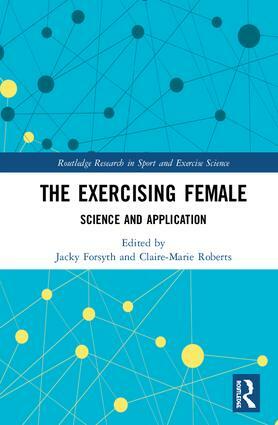 Based on the latest research, and treating women as a unique population, the book seeks to critically evaluate current debates, present the science underpinning female sport and exercise performance, and inform applied practice for the exercising female. Exercise and the menstrual cycle, contraception, pregnancy, motherhood, and menopause. Body image, exercise dependency, the psychology of sports performance, and homophobia in female sport. The Female Athlete Triad, bone health, musculoskeletal injury, and breast biomechanics. Nutritional requirements for the exercising female, immune function and exercise, and cardiovascular health. Filling a considerable gap in book literature around the science of female sport and exercise, this is crucial reading for any student studying female sport and exercise science, researchers of female sport, and any coach, sport scientist, strength and conditioning coach, sport psychologist, physician, or physiotherapist working with female athletes. Jacky Forsyth is an associate professor at Staffordshire University, UK. She is a prominent researcher and speaker in the area of women’s exercise and health. Her research is centred on the interactive effect of ovarian hormones, exercise, and bone. One of her research priorities is to promote, raise awareness, and to advance understanding of the key influences, which impact the exercising female. She is vice chair of the Women in Sport and Exercise Academic Network (WISEAN), the aim of which is 'To grow, strengthen, and promote research on women in sport and exercise, with the ultimate goal of optimising women’s athletic success and their participation'. Jacky publishes regularly in peer-reviewed journals in her field. Claire-Marie Roberts is a senior lecturer in Sport and Exercise Psychology at the University of the West of England, Bristol, UK, and a practising Sport Psychology consultant. Her experiences of working with athletes reflect her research interests. These include female-specific issues relating to career transitions in sport such as pregnancy and motherhood and the psychology of female sport performance. Claire-Marie is the chair of (WISEAN), a non-executive board director of UK Anti-Doping, and a member of the Women in Sport Research Action Group. The Routledge Research in Sport and Exercise Science series is a showcase for cutting-edge research from across the sport and exercise sciences, including physiology, psychology, biomechanics, motor control, physical activity and health, and every core sub-discipline. Featuring the work of established and emerging scientists and practitioners from around the world, and covering the theoretical, investigative and applied dimensions of sport and exercise, this series is an important channel for new and ground-breaking research in the human movement sciences.